Home » General posts » Making the Police Force Count: Past Roles of Garda Siochana. Making the Police Force Count: Past Roles of Garda Siochana. On February 1st 2016 the interviews will begin to select enumerators for the census to be undertaken in the Republic of Ireland on April 24th. Ninety years ago this was a task undertaken by the newly created Garda Siochana (trans. ‘Guardians of the Peace’). It was just one of many duties imposed on the force, which worked on behalf of many more ministries than the Ministry of Justice. I am working on a historical fiction suggested by a story told to me by a friend about his aunt. Against family opposition, she married a member of the force in the 1930s. To help with background material I have been researching the early history and formation of the force and came across these interesting facts. Sheep Dipping Orders and Swine Movement Orders. In addition, Gardai were required at fairs and markets, at cattle loading banks, on routes to and from markets, and on the cattle routes to ports and railway stations. Outbreaks of all notifiable diseases, had to be watched for by the Gardai, reported to the Ministry, and immediate action taken to isolate the animals and the area. Returns of sheep owners were recorded by the Gardai and forwarded to the various local authorities. 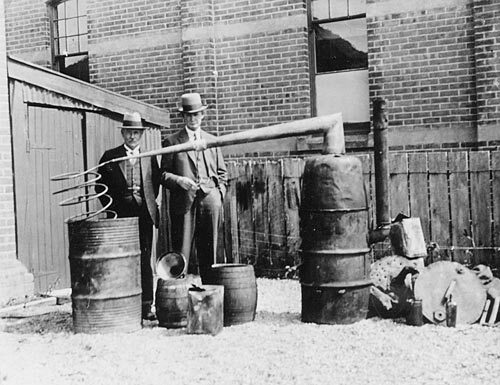 An important and controversial role, one of many undertaken on behalf of the Ministry of Finance, was the putting down of illicit distillation. On 28 December Garda Thomas Dowling, aged 29 years from Fanore, Co. Clare, was ambushed and shot dead passing the graveyard at Craggagh Fanore, in reprisal for his enforcement of the illicit distillation laws [the article does not indicate which year, although the item refers to the period between 1922 and 1928 FP]. Examine and license buses, taxis and hackneys. One Garda was even employed as School Attendance Officer. Gardai were responsible for certifying eligibility for receipt of Unemployment Benefit. Each year 1,000 Gardai were employed for six weeks in the collection of agricultural statistics. Various other statistics were called for from time to time, such as a Census of Road Traffic and a Census of Shops for the Commission of Food Prices. By franklparker in General posts on January 27, 2016 .